We are very proud to announce that this month Animmersion has turned 12. Founded by Dominic Lusardi and Sam Harrison, the business has experienced significant growth over the past decade as digital tools have become increasingly popular with a growing number of businesses. Over the years we have catapulted from being purely an animation company to a complete full services interactive digital content company, to now be recognised as one of the leading companies of its kind throughout the country. And the last couple of months, which has seen the appointment of two new members of staff coupled with a series of major contract wins, shows positive signs that we are firmly on track – if not well underway in exceeding – our ambitious growth plans. We are extremely proud of everything we have achieved to date and we could not have done it all without the continued dedication of our very talented team. We would like to take this opportunity to thank them all for their hard work and look forward to what the future holds. If you would like to know more information about our services, please call +44 (0)1642 688091 or email info@animmersion.co.uk. 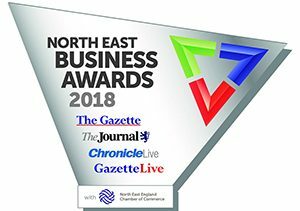 Animmersion is delighted to announce that we have been shortlisted for an Innovation Award at this year’s North East Business Awards. The regional awards recognise business talent within the area and celebrates key achievements amongst individual companies. Animmersion has been shortlisted alongside two other companies and the winner of this prestigious award will be announced at a ceremony being held at the Olympia Building, Teesside on the 22nd March. The purpose of the innovation award – sponsored by Teesside University – is to honour a leading company that has introduced an innovative product or service. As a pioneering company we are constantly seeking new ways to breathe life into existing content in ways that is more engaging than traditional methods. One of our greatest innovations to date is the creation and development of a virtual construction game designed to support the training needs of existing personnel and entrants into the construction sector. Our aim is to introduce immersive technology to businesses, not just as a ‘nice to have’ tool, but as a solution that adds real value. As such, our training solutions can ultimately lead to a reduction in costs for our clients and acts as a valuable platform of information that takes personnel through an immersive experience that couldn’t be done in the real world. We would like to thank all of the team at Animmersion for their continued dedication and hard work and we look forward to the awards ceremony. 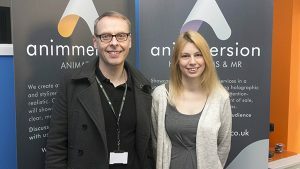 We are delighted to welcome to the Animmersion team our latest two recruits, Claire Stockton and Andy Wilkin. Claire steps into the role of Project Manager and will be responsible for scheduling all projects, as well as liaising with both clients and the team to ensure projects are consistently being delivered to the highest possible standards. Claire joins us having most recently worked at Phusion IM as a Business Support Manager. Impressively, Claire holds a masters in Multimedia Application and has a vast amount of experience in 3D Immersive environments. Andy joins our team of 3D Developers possessing over 17 years’ experience in the field. Andy attended university with Animmersion’s business owners Dominic and Sam and has a BA Hons in Creative Visualisation. Since graduating Andy has worked for some impressive animation companies based down south including Glassworks, The Mill and Studio AKA where he has worked on projects for high end clients including the likes of Wrigleys and Audi. The new appointments play an integral part in achieving Animmersions ambitious growth plans as we look to employ eight additional staff within the next year. We would like to take this opportunity to welcome both Claire and Andy to the team and wish them the best of luck in their new roles. 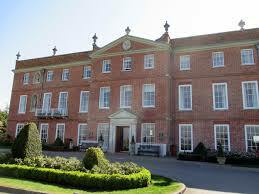 We will be exhibiting at this year’s highly anticipated Health, Safety and Environmental (HSE) Congress on the 7th and 8th February at Four Seasons Hotel, Hampshire. The event provides an ideal opportunity for Animmersion to network with some of the UK’s leading HSE professionals and showcase our latest technologies that can streamline and improve training within businesses to significantly enhance workers safety. With 20 solution providers and 15 speakers, the HSE Congress event boasts an engaging programme over the course of two days that will see a content-based platform of keynote speakers, panels, workshops and roundtables taking place. These will focus around topics including safety culture, behavioural safety, digital transformation and future technologies, as well as many more. 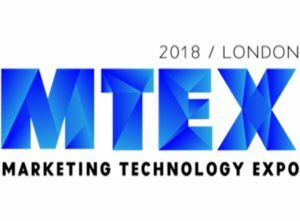 As such, our Managing Director, Dominic Lusardi and Studio Manager Andrew Liddell will be delivering a workshop to showcase our leading virtual reality technology, demonstrating how such solutions are becoming increasingly vital to facilitating workers safety. We also want businesses to think about the future technologies that are emerging and the great potential that they offer in terms of improving operational performance and safety, as well as reducing costs. If you would like to meet up with Dominic at the event to discuss our leading digital visualisation solutions, please email dlusardi@animmersion.co.uk.